Quick overview Tax revenues pay for many public services, including roads, health care, and education. However, it has become a contentious political issue of public debate. 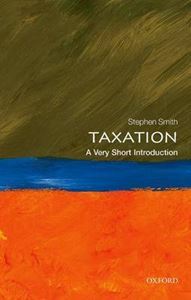 In this Very Short Introduction, Stephen Smith explains its history and its main principles; arguing that we'd all benefit from an understanding of the role of taxation in society. Taxation is crucial to the functioning of the modern state. Tax revenues pay for public services - roads, the courts, defence, welfare assistance to the poor and elderly, and in many countries much of health care and education too. More than one third of national income in the industrialized (OECD) countries is on average taken in taxation. Taxes affect individuals in many ways. Taxes paid on income and spending directly reduce taxpayer disposable income, taxpayers face the hassle of tax returns and making payments, and they may be anxious about the possibility of investigation and enforcement action. People also adapt their activities in various ways to reduce the impact of taxation - putting money into tax-free savings accounts, or making shopping trips to other countries where taxes are lower. Taxation is therefore central to politics and public debate. Politicians that make reckless campaign promises about taxation then have to live with the uncomfortable consequences if elected. Businesses lobby for tax breaks that they claim will create jobs and prosperity. In this Very Short Introduction Stephen Smith shows how taxes have real effects on citizens and the economy that tax policy-makers have to balance. Although tax policy will always be a highly political issue, he argues that public decisions about taxation would be improved by a better understanding of the role of taxation, and of the nature and effects of different taxes. ABOUT THE SERIES: The Very Short Introductions series from Oxford University Press contains hundreds of titles in almost every subject area. These pocket-sized books are the perfect way to get ahead in a new subject quickly. Our expert authors combine facts, analysis, perspective, new ideas, and enthusiasm to make interesting and challenging topics highly readable.